The 9581 SST Return Path Analyzer is the only DSP-based return path analyzer in the industry. The 9581 SST Return Path Analyzer is the only DSP-based return analyzer in the industry. The 9581 SST Return Path Analyzer is the centerpiece of the Guardian Return Path Maintenance System, supporting Trilithic field units and supplying monitoring data to local and remote controllers. The only DSP-based return path analyzer in the Industry, the 9581 SST is as cost-effective as it is fast and versatile. It can scan the entire ingress spectrum in less than 90 milliseconds (200 times faster than analog instrumentation can), effectively capturing transient ingress bursts that are especially disruptive to telephone and high-speed data services. The 9581 SST accepts 16 inputs and covers the reverse spectrum from 0.3 MHz to 65 MHz. Because of DSP, these analyzers are unequaled for detecting ingress bursts occurring at low repetition rates. When set to its fastest scanning mode, the 9581 SST rescans all connected test points 80 times per second, making it virtually impossible for any relevant ingress impulses to escape detection. CAT5e Ethernet patch cable (6 foot) with 100 Ohm impedance and RJ-45 Male to Male connectors. Rack mounted (2U) 65 MHz unit with US Data Frequencies (50.00-53.75 MHz or 70.00-75.75 MHz) or International Data Frequencies (80.5-92 MHz or 104-115 MHz), Two TPM-8 Options & ECM + SNMP Communication Interface and built-in 120/240 VAC power supply or -48VDC. The 9581 SST R4 is optimized for status monitoring in medium to high density node applications and spectrum analysis of the return path up to 65 MHz via the ViewPoint Server with Return Path Management (RPM) Module. The 9581 SST R4 provides the combination of resolution, detector mode and an embedded SNMP agent option while simultaneously supporting return sweep, ingress troubleshooting and continuity testing applications. TraffiControl is included in this release. The complete kit includes: 9581 SST R4 rack mounted (2U) 65 MHz unit with US or International Data Frequencies, built-in 120/240 VAC power supply and AC power cable or -48VDC input. REQUIRES SST CONFIGURE PC SOFTWARE FOR CONFIGURATION. REQUIRES VIEWPOINT SERVER SOFTWARE OR INTEGRATED SERVER WITH RPM MODULE FOR ANALYSIS. ANALYSIS CAN BE ALSO BE PERFORMED WITH LEGACY VIEWER II SERVER SOFTWARE OR INTEGRATED SERVER. Rack mounted (2U) 85 MHz unit with built-in 120/240 VAC power supply or -48 VDC that is optimized for status monitoring in medium to high density node applications and spectrum analysis of the return path up to 85 MHz via the ViewPoint Server with Return Path Management (RPM) Module. The 9581 SST R5 provides the combination of resolution, detector mode and an embedded SNMP agent option while simultaneously supporting return sweep, ingress troubleshooting and continuity testing applications. TraffiControl is included in this release. The complete kit includes: 9581 SST R5 rack mounted (2U) 85 MHz unit with built-in 120/240 VAC power supply and AC power cable or -48VDC input. REQUIRES SST CONFIGURE PC SOFTWARE FOR CONFIGURATION. REQUIRES VIEWPOINT SERVER SOFTWARE OR INTEGRATED SERVER WITH RPM MODULE FOR ANALYSIS. ANALYSIS CAN BE ALSO BE PERFORMED WITH LEGACY VIEWER II SERVER SOFTWARE OR INTEGRATED SERVER. THIS UNIT IS NOT COMPATIBLE WITH THE RSVP² FIELD UNIT. Euro AC power cable for Trilithic products. 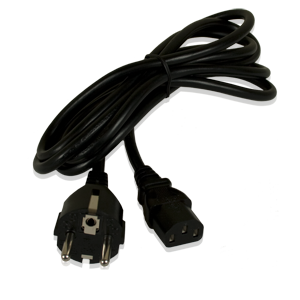 This is a Euro standard 2.5 Meter power cable with a Continental Europe 2-prong plug Male (IEC 884/CEE 7/VII) to 3-pin shroud plug Female (IEC 320C13). USED AS REPLACEMENT FOR FOLLOWING EURO PRODUCTS: 180 DSP, 360 DSP, 720 DSP, 8300 FST, 8300A FST, 860 DSPh, 860 DSPi, 860 DSPr & 1G DSP. USED AS ACCESSORY FOR FOLLOWING US PRODUCTS: CT-2, CT-3, CT-4, 8310 RSA, 860 DSP, 860 DSPh Input Expander, 9581 SST R3, 9581 SST R4, 9581 SST R5 & 9581 TPX. AC power cable for Trilithic products. This is a US standard 6 Foot power cable with a 3-prong grounded plug Male (NEMA 5-15P) to 3-pin shroud plug Female (IEC 320C13). USED AS REPLACEMENT FOR FOLLOWING US PRODUCTS: CT-2, CT-3, CT-4, 180 DSP, 360 DSP, 720 DSP, 8300 FST, 8300A FST, 8310 RSA, 860 DSP, 860 DSPh, 860 DSPh Input Expander, 860 DSPi, 860 DSPr, 1G DSP, 9581 SST R3, 9581 SST R4, 9581 SST R5 & 9581 TPX. The I-Stop reverse test probe is a test accessory you can use with signal level meters and/or analyzers for bi-directional measurements with no risk of power damage. This is the SST Configure software for the 9581 SST R3, 9581 SST R4, & 9581 SST R5 Return Path Analyzers.